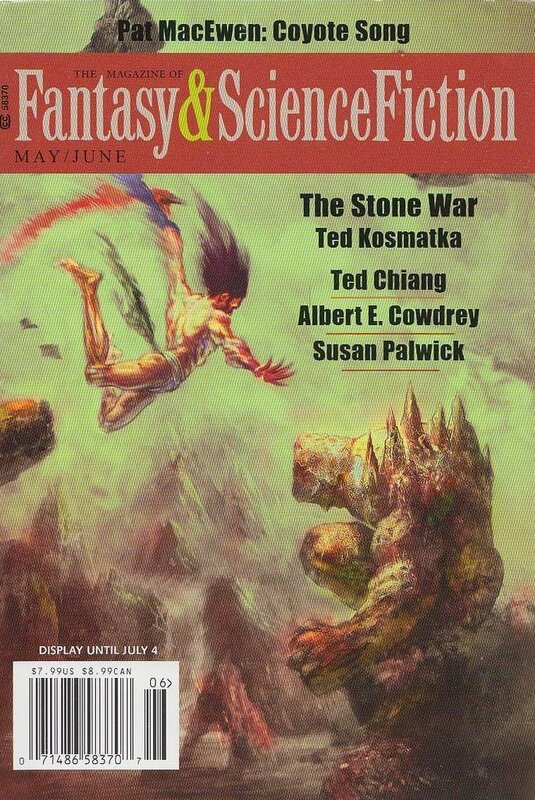 "Coyote Song," by Pat MacEwen, appeared in the May/June 2016 issue of The Magazine of Fantasy & Science Fiction, published May 3, 2016, by Spilogale Inc. Pro: The story is well-written, and has a very well-defined plot, with plenty of tension and action. It's fun to watch the matter-of-fact way Yutu and Nathan use their different kinds of magic together. It's a nice angle that Coyote gets personally involved because he objects to foreign magic invading his territory. Con: The ending is jarring. Yutu only survives as a zombie, with no indication how long that will last (or even whether she'll start to rot). This seems entirely unnecessary to the plot--it's just the result of her bad luck--and it somewhat spoils the story.